Great Last weekend for the Delta! 110 lb Brooksi's Colonial Rimfire, along with Heath Daniels and Jason Dillon concluded the season with an unforgettable morning! We finished with 1 Gadwal Drake, 3 Squealers, 3 Greenheads, 2 Suzys, and 3 Greenwings. 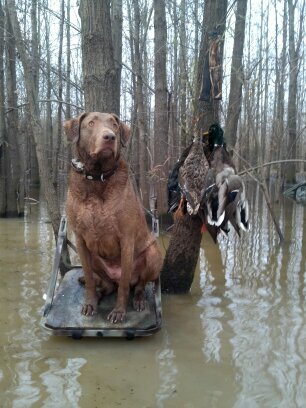 Unfortunately I forgot my tote, so we just had to pile them up on the platform,but this was only my second limit of puddle ducks, ever, and his first. 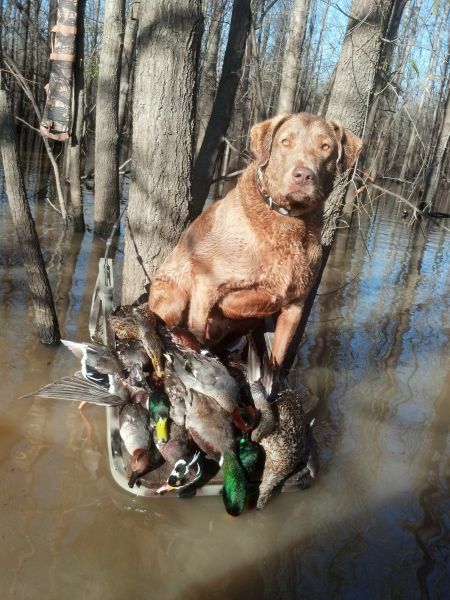 We are thankful to be a part of the Mississippi hunting experience! We have had a couple good hunts in the past several weeks. This particular morning was cloudy and heavy fog. I was a bit nervous because it was 65 degrees, and we hadn't seen the first duck until ten minutes after shooting light. I killed the first Woody Drake and loaded him on the tote. While doing so I noticed Rimfire staring and trembling overhead. At this point I realized that I was in for a pretty good hunt. At this point I began to work ducks and pick my shots; I fired a total of 8 and took home my first ever limit of mallards (3 drakes, 1 hen), and two woody drakes which was also my first limit of puddle ducks. We were done by 7:20 so I took a couple photos and went home for a nap. WarriorSkulls has not filled this section yet.